Last week when looking at the increasing popularity of carrier billing I noticed that the percent of purchases made through carrier billing was larger then the percent of customers who had access to carrier billing. 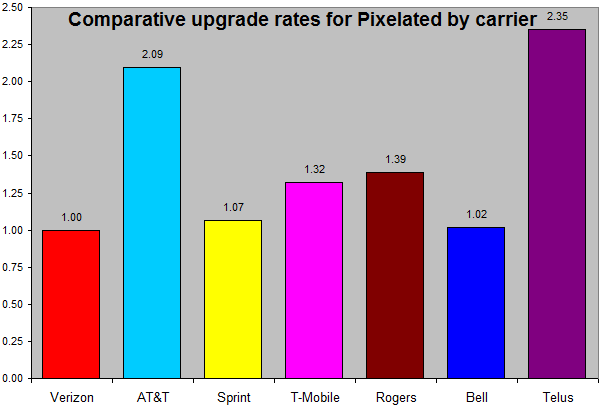 A quick look at the number for December then showed that users of AT&T were more then twice as likely to upgrade from Pixelated to Pixelated Plus then users from Verizon, Sprint, and T-mobile. I attributed this difference to having the option of carrier billing, but AT&T is also the only one of these carriers to offer RIM’s flagship BlackBerry Torch. In order to double check these assumptions I looked at the three largest Canadian carriers who all offer the Torch, and only one (Telus) offers carrier billing through AppWorld. In the interest of not actually reveling upgrade rates, the below chart instead shows rates normalized to the rate at Verizon, such that Verizon is always 1.0 and carriers with a higher upgrade rate show values higher then one. Additionally this is not a true measure of upgrade rates but a value of paid downloads over free downloads which is good enough to normalize the amount of purchases over the relative size of the carriers. This data is from the month of January. As the chart shows the two wireless providers that offer carrier billing through AppWorld have roughly double the percentage of customers who are willing to spend money on an upgrade. As such one of the best things that RIM can do to help developers is to get more providers on board with carrier billing.